I think it must have been a Saturday, that sunny day, April 4, 1987, because both Alice Yang and Dominique LeGrand were with me working at the store. Alice and I had a linen store in Toronto, where the Vidyadhara once visited to purchase a fine tablecloth. I remember very clearly when the phone rang. Dominique and I were holding out a large beautiful tablecloth to show a customer the fine detail. The phone on the desk behind me rang and I heard Alice answer it in her chipper voice. With one ear cocked to the customer and one to Alice, I slowly became aware of the long silence behind me. Turning my head around I saw Alice bending over the phone, her tiny body shaking in quiet sobs. I immediately excused myself and went to Alice taking the phone in time to hear the voice saying: “We are beginning to prepare the salts for his body to be packed in.” It was a friend calling from Karme Chöling; they had just received the request from Halifax. Alice and I clung to one another sobbing. Dominique escorted the customer to the door apologizing and explaining that we had just received some very bad news about a friend. The news that we had all been dreading, the news that we could not and would not hear, had at that very moment landed, breaking through all our defenses, becoming the most heart wrenching news of our lives. The Vidyadhara was dying. I don’t know how long we stood there holding one another and sobbing, loss of loss, pain of pain. Both Dominique and I were active in the Dorje Kasung. Our devotion and our sense of responsibility quickly dawned in the midst of our personal sorrow. We decided to change into our uniforms and report to the Dharamadhatu at once. The sangha would soon be gathering to practice for the Vidyadhara. I think many felt we could still save him if we practiced hard. I remember Dominique intuitively making a sign to put on the door as we left. It read: “This store will be closed until further notice.” As it turned out, the store was closed for over two months, until after the Vidyadhara’s cremation. Putting on my uniform, placing my pins, feeling both heartbreak and pride along with a great sense of duty, I phoned my Rusung and reported for duty. My post was beside the phone, awaiting the report from Halifax. The shrine room was full of fervent practitioners. Hope, fear, and courage permeated the air, mixing with the smell of incense. The phone rang! “The Vidyadhara has passed into parinirvana,” the voice said. 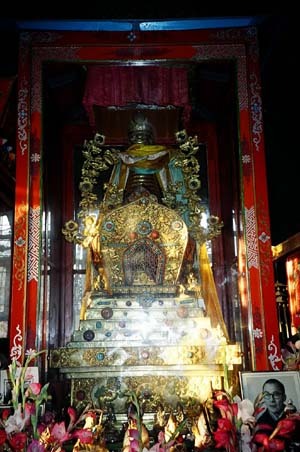 I remember shaking and asking the kasung on the other end to spell parinirvana. He impatiently said, “He is dead.” It felt so brutal, so final! Entering the shrine room, all faces turned towards me, held in suspended anticipation. Unable to speak, I cowardly handed my note to the umdze who bravely read it. As I recall, the shrine room erupted in disbelief, then belief, then searing pain, then tenderness for each other, then warriorship as we all stood to attention and belted out the Anthem, tears streaming down our faces. It was about 1:00 AM when Dominique, Barry Poutney, and I hit the TransCanada Highway heading east towards Halifax. Even though the message coming from Halifax was “Don’t come to Halifax,” nothing could or would have stopped us. (It turned out to be a mistaken message.) We drove straight through, arriving in Halifax 24 hours later. Although exhausted, before checking into the Lord Nelson Hotel, Dominique and I wanted to report to the Kasung informing them that we were in Halifax and would be available for duty, as soon as we had a few hours sleep. We drove to Tower Road, somewhat surprised to see Karma Dzong so well lit up at 3:00 AM. We were warmly welcomed, and it felt good to see familiar faces. We bumped into Simon La Haye, who had just arrived from Montreal. Quite auspiciously, we had seen him on the highway somewhere in Quebec and waved, continuing to look for him along the way, as we all journeyed to Halifax. The drive felt like 24 hours of being locked in an iron box. We entered into a time zone, and that never really changed. We held on to our pain and sorrow. 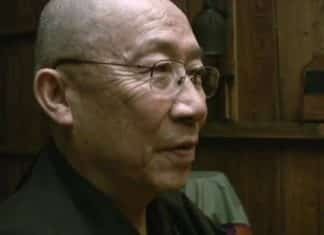 I kept imagining Rinpoche’s frail body laid out in a coffin somewhere. That was the only image I had of dead people. I cried all the way. I only became aware of my state of mind by the contrast of the atmosphere at Karma Dzong. There it seemed less claustrophobic, there was movement, even a note of lightness. Someone suggested we go to the Court. Still under the impression we were just going to the Court to report to the Kasung and then retire to our hotel, we knocked on the front door. Surprised first by the smells and smoke, then by the numbers of people, we were quickly ushered into a room full of people practicing. I squeezed in, slowly becoming aware of the room across the hall. As I recall, everything seemed dimly lit. In a short while, someone came up to the three of us and said, “Okay, you can go in now.” We were ushered into the room across the hall, and directed to the front row. I remember silently taking my place beside my traveling companions, my head bowed in reverence, only aware that the room was full of practitioners. I don’t know how long it was before I looked up! There he was, sitting up. Was it him? It didn’t quite look like him. Yes it was him, he looked so strong, he looked both young and old, ageless, he could be young, he could be 2,500 years old. I thought, “Oh my god, he is/was Buddha.” The frail and sickly corpse of my imagination was instantly dead, gone, evaporated. The room was brilliant, full of pulsating energy. I was energy, wide awake! We were allowed to stay in that front row about 15 minutes, then others came to take their turn. Every day one could feel the energy change, his luminous presence slowly beginning to dim, until it was decided to take his body down. Dominique and I pulled shifts driving both Lady Diana’s and the Lamen’s vehicles to Karme Chöling. While there, we began to sense the magnitude of the plans for Cremation Day, and the enormous preparation that needed to be done. The mandala was beginning to come together like never before and we decided there was no other place on the planet to be. We stayed, but that is another story. © 2003 by Marilyn Thurrott. Marilyn Thurrott first heard about the Vidyadhara in the early 1970's while living on a commune in the Kootenays of British Columbia. Over the years, she became a dedicated student and attended seminary in 1982. During the Seminary, she was given the refuge name, Dharma Protector Divine Lady, and was inspired to join the Dorje Kasung. She has continued her kasung service over the years while living in Halifax, Toronto, and Karme Chöling and has held the posts of Rusung and Regimental Commander. Marilyn returned to the Kootenays in 1999, where she works as a hospice volunteer and continues to teach dharma classes. She lives with her daughter and grandchildren. Her son lives nearby, and the entire family are active members of the Kootenay Shambhala Centre. Marilyn has attended Khenpo Tsultrim Gyamtso Rinpoche's programs at Karme Chöling for the past seven years and plans to enter the three-year retreat at Gampo Abby in 2004.